Nothing builds reader loyalty as much as engagement. Get into a conversation with your users! 98% of online users are completely passive (and some still wonder why their users don’t convert). Opinary helps you to engage, understand and monetize your audience with easily embeddable tools. 98% of online users are completely passive. (and some still wonder why their users don*t convert) Opinary helps you to engage, understand and monetize your audience with easily embeddable tools. Like the 69 million users who interact with our tools every month. Step 1: Highly relevant polls are placed in your content, either by you or our algorithm. Step 2: Readers share their opinion with a single tap. Step 3: After voting, the engaged user is shown a call-to-action or sponsored content. 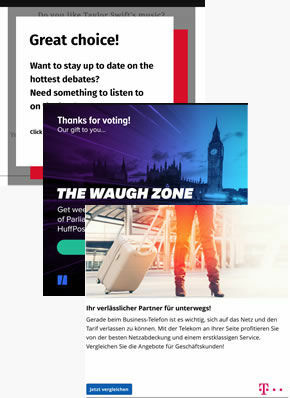 When readers vote, they’re highly engaged – so we show them a Call To Action driving social follows, newsletter sign ups or subscriptions with industry-leading conversion rates. Opinary’s data science team is on hand to build a picture of your audience based on deep-dive insights. Our tools are designed to entice users and make them feel invested in your content. Turn passive users into loyal readers. We want advertisers to stop shouting at customers and start listening. Through intuitive sponsored polls, brands can do market research and engage with potential customers in a more respectful way. Opinary makes your readers’ opinions part of the story. Our data science team can help you to turn the results into interactive, exciting content. We take care of it all – you can just sit back and watch your readers become engaged, loyal, and empowered.